ADL Hip Kits help the user dress independently while maintaining appropriate precautions. Kits come with a mesh bag to hold equipment and can be hung up in one convenient place. There are four kits available: Kit 1: For users 5'7" and under. 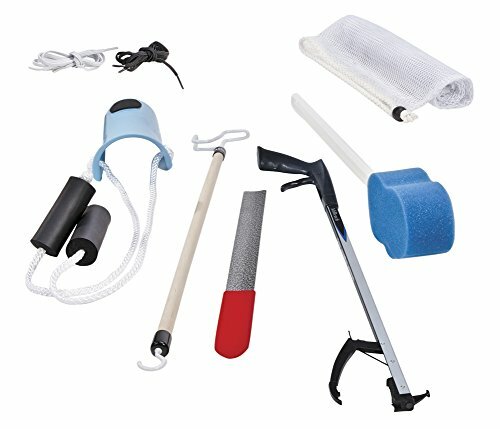 Includes 18" Shoehorn, 26" Reacher, Standard Sock-aid, Dressing Stick, 2 pair of black elastic shoelaces, two pair of white elastic shoelaces, hourglass-shaped, long-handled sponge and a washable, reusable mesh bag.